If we sell it, we recommend it. 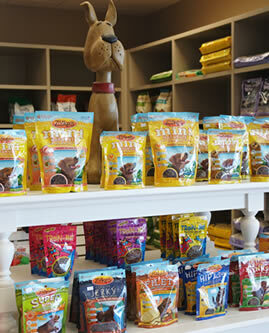 You'll find only the best pet products in our boutiques. Pawtropolis has two great Pet Boutiques. Our goal is to carry items that you may not be able to find other places, items like dog backpacks, training gear and toys that are specific for small or large breeds. We also carry basic items like beds and bowls. We are proud to offer some of the best pet foods. We do extensive research to make sure we are only carry brands that we feel proud to sell and recommend. 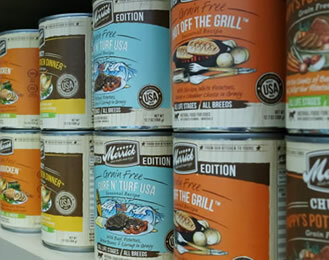 We may not carry every brand, but you can rest assured that if we sell it, you can trust feeding it to your pet. While visiting our Pet Boutiques be sure to look up high. You will find our large flat-screen TV's playing live feeds from our Doggie and Kitty Cams recording all the action! Come in and browse both of our locations for all your pet care needs. Dogs have a natural desire to chew and to destroy. This desire often gets dogs in trouble both with their owners and with their vets. Buying your dog appropriate toys and using them effectively can go a long way in curbing bad behavior. Hard to destroy toys, like this Kong pictured here, is a great choice. Kongs are made to be stuffed with extra special goodies. Filling them with your dog's regular dinner gives them a fun activity that is stimulating for them both physically and mentally.